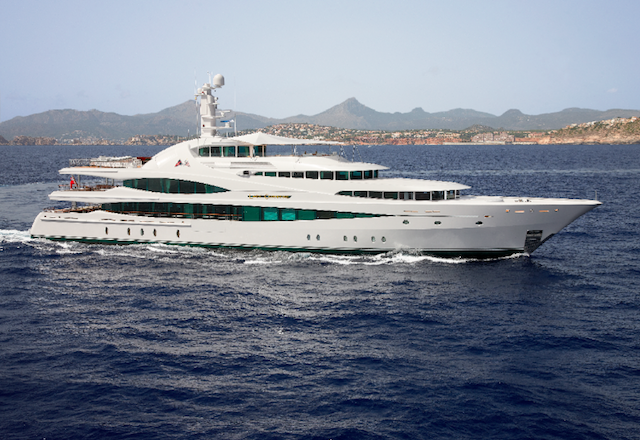 Feadship Mega Yacht Lady Christine is a 68 metre vessel built at the Royal Van Lent shipyard, based on a design by De Voogt Naval Architects. 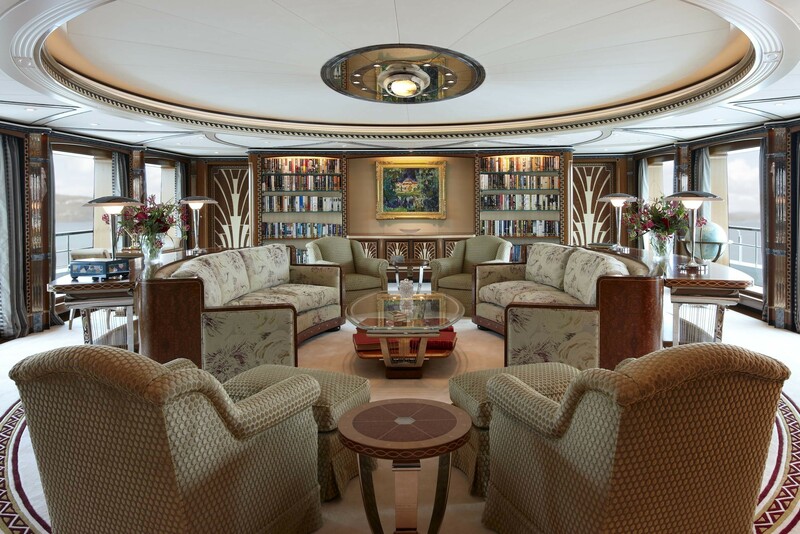 She features a stunning and breathtaking interior by a British designer Rodney Black. 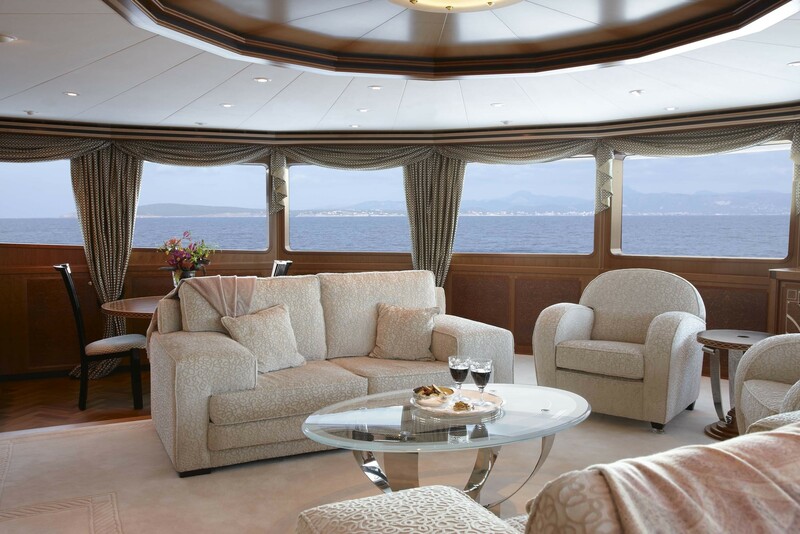 Lady Christine motoryacht offers luxury accommodation for her Owners and eight guests in four superbly furnished staterooms. 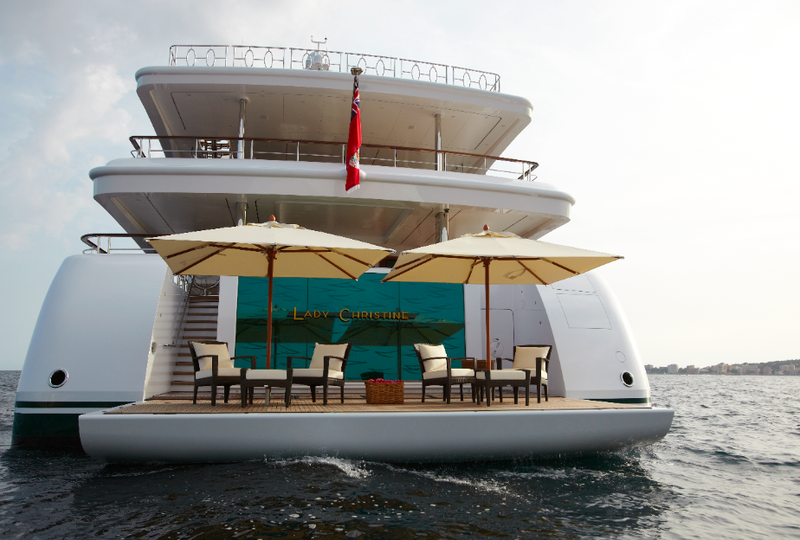 Superyacht Lady Christine features a very unique exterior look, where a split-level layout was created in order to incorporate the owner's observation lounge, the 'terraces' either side of the main deck and the addition of an extra helm station on the sun deck . 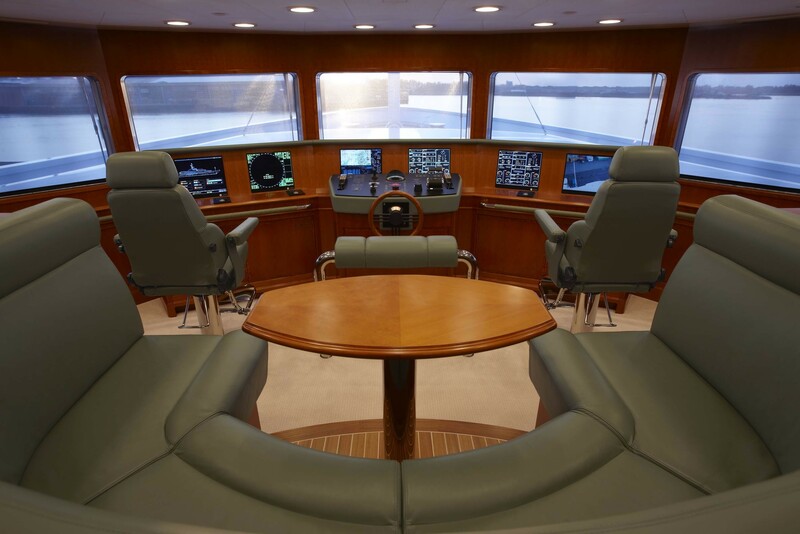 The wheelhouse was therefore moved down a level and forward part of the deck was raised in order to create a complete owners' deck. 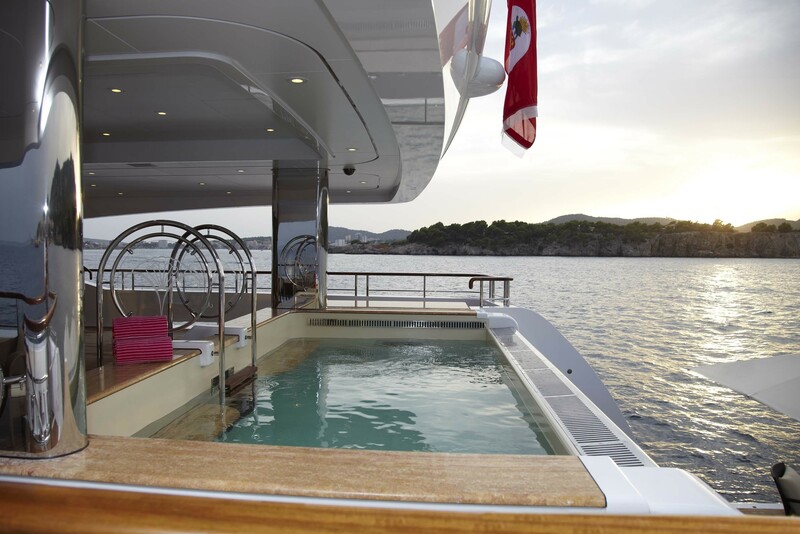 Lady Christine features a beautiful swimming pool on the main deck with an infinity pool effect. 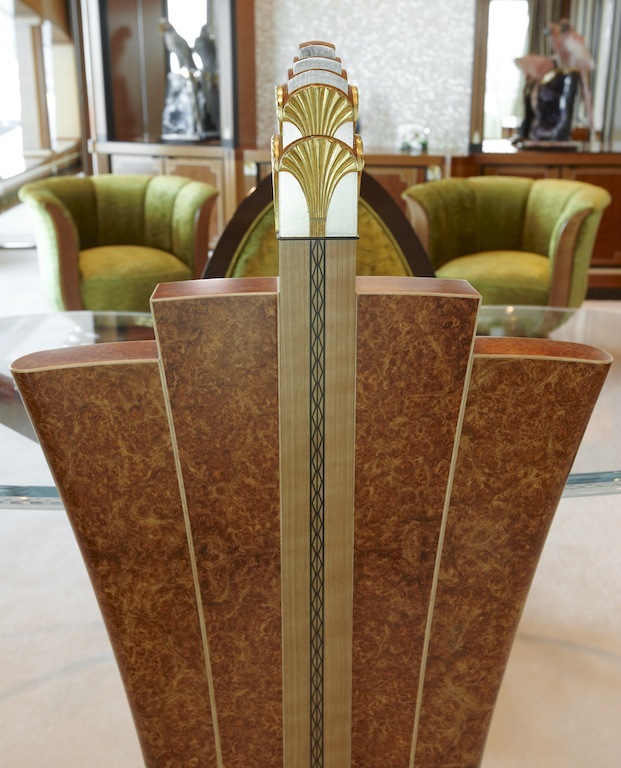 Lady Christine’s funnel (tower) is a design element in its own right, positioned to maximise the freedom required for a helicopter to land. 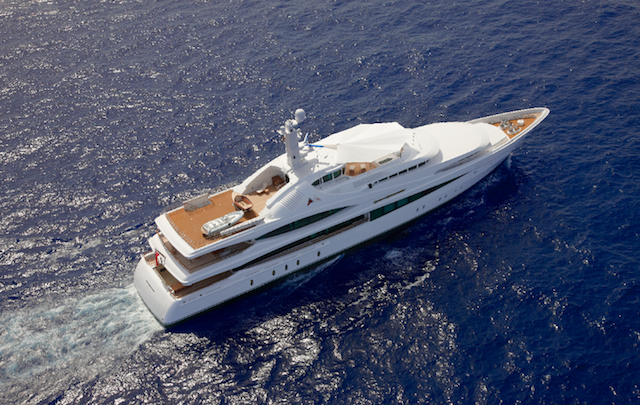 Style-wise it holds everything together as the line from the bow stretches through all three forward superstructures and ends in the funnel. 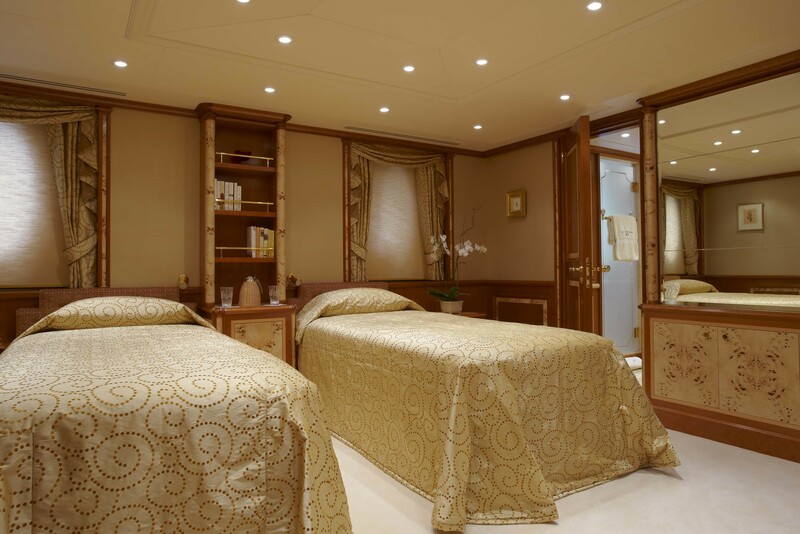 There is only one large dome and one small dome, with the normal satellite television domes being noticeably absent. Because the owners prefer to read books when onboard (and have a good collection of DVDs to meet any lingering desire for small screen entertainment) there is no satellite TV onboard of superyacht Lady Christine. 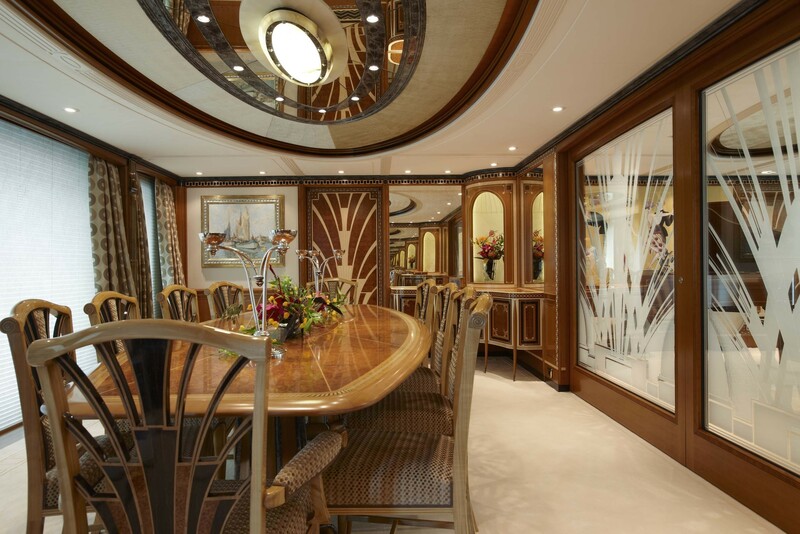 Superyacht Lady Christine has an extraordinary and elaborate interior, with fine detailing and finishes right through the yacht. 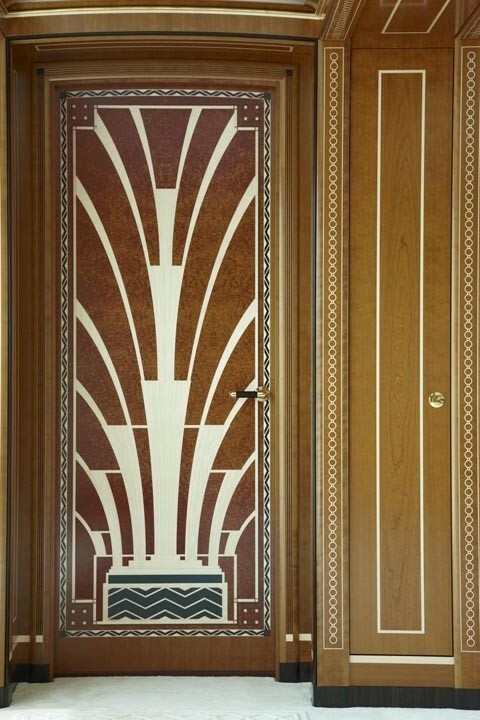 With the exception of the guest suites and the original design for the cinema, which were designed by Jean Guy Vergès, the entire interior comes from the boards of Rodney Black Design Studios. 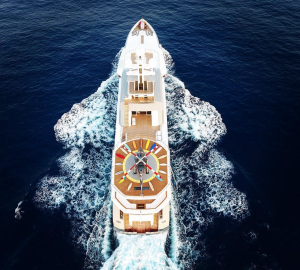 Renowned for creating sumptuous architecture, landscape and interiors onshore, Lady Christine is the company’s first superyacht project. 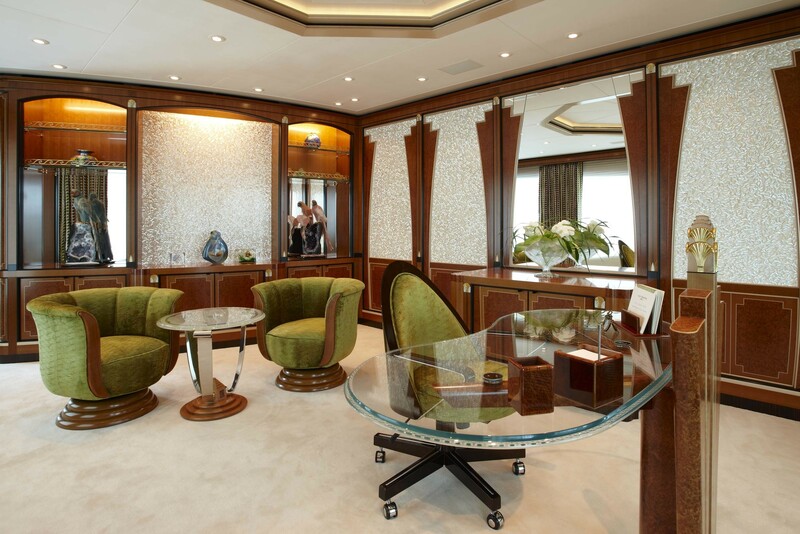 Rodney Black and Royal Van Lent teamed up with Feadship’s joinery company Van der Loo and a formidable team of specialists for the furniture, engraved glass, carpets and curtains. 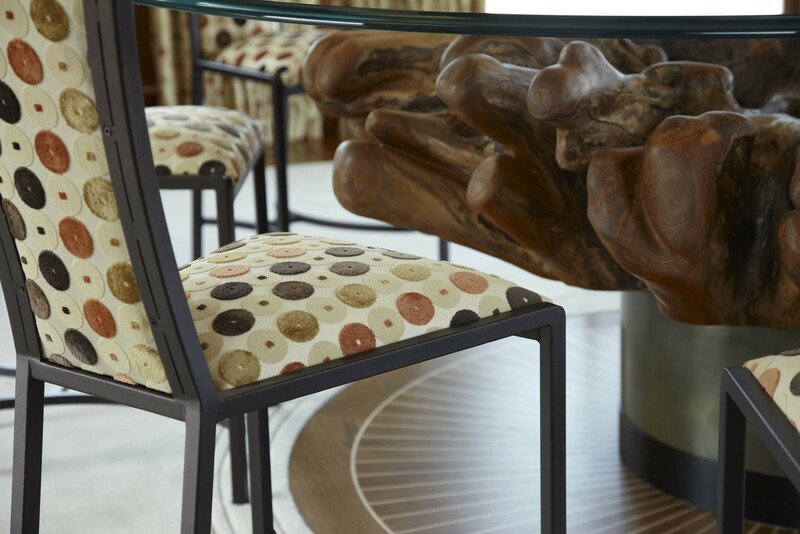 The result is a wonderful fusion of materials, fabrics, woods, glass, precious metals and marbles that offers endless surprises at each and every turn. 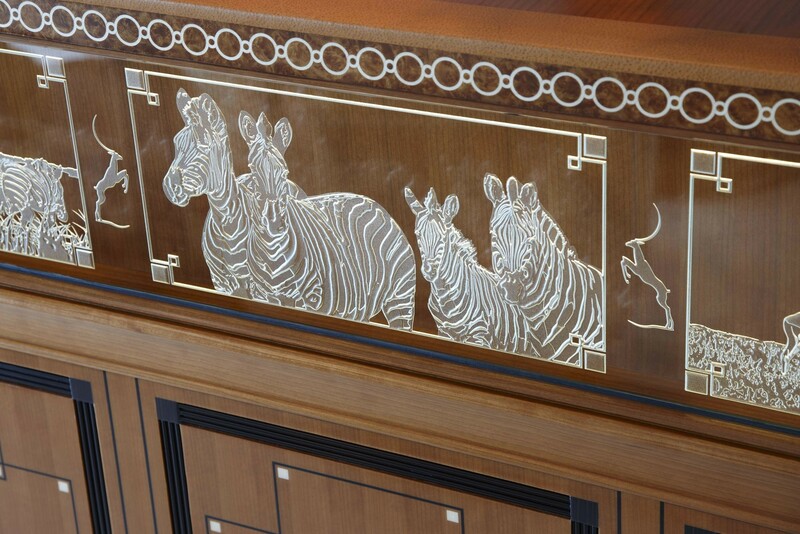 A keynote feature is the liberal use of marquetry and inlay work throughout the vessel. 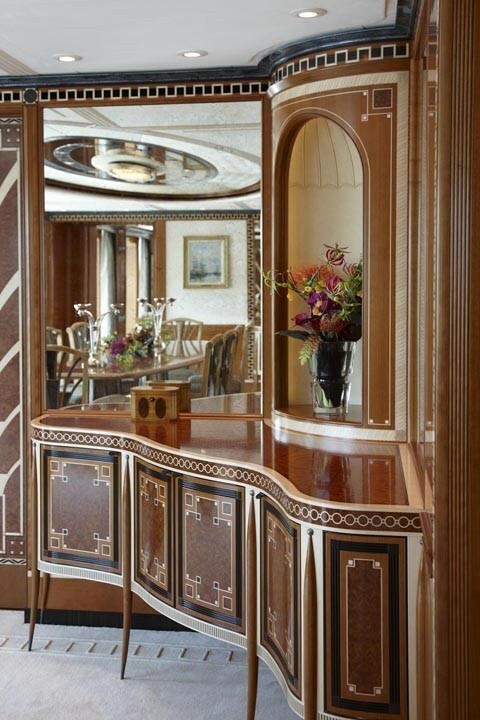 Marquetry – the art and craft of covering a structural frame with small pieces of veneer to form decorative patterns, designs or pictures – is most spectacularly on view in the entrance to the main deck and owner’s deck. 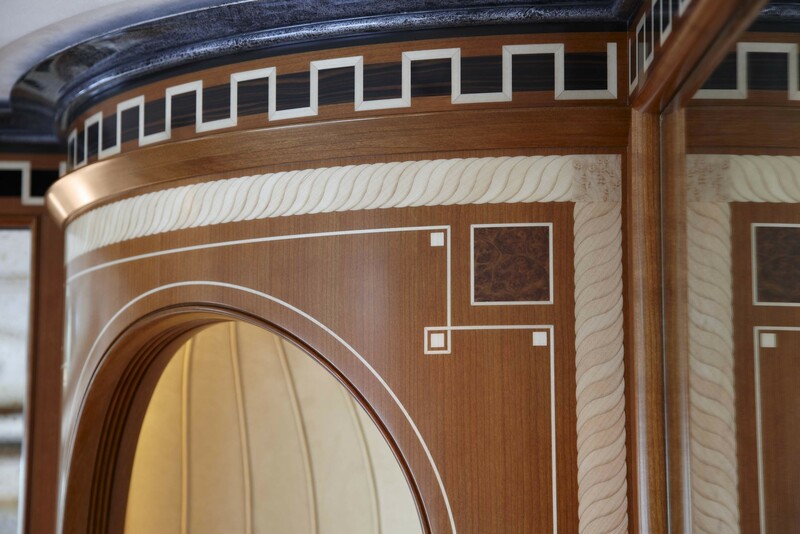 Another virtually ever-present aspect of the interior is the intriguing synthesis of four woods: macassar ebony, maple, cherry and an exotic amboyna burr. Lady Christine is a tall yacht and at her peak on the sun deck is a hugely impressive indoor area called the Key West Room, used most during the day when cruising and for informal lunches or very relaxed dinners. 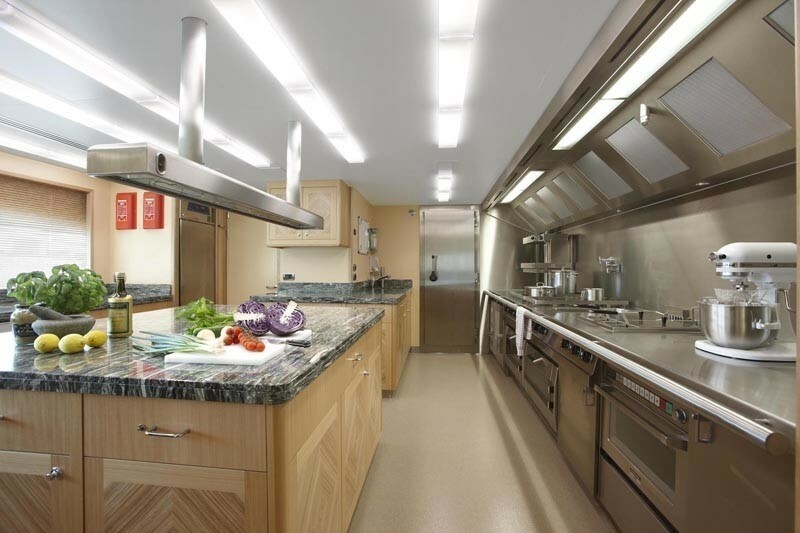 Various cooking options are also featured on the furtherest aft are of the sundeck, including a BBQ, teppanyaki grill and pizza oven. 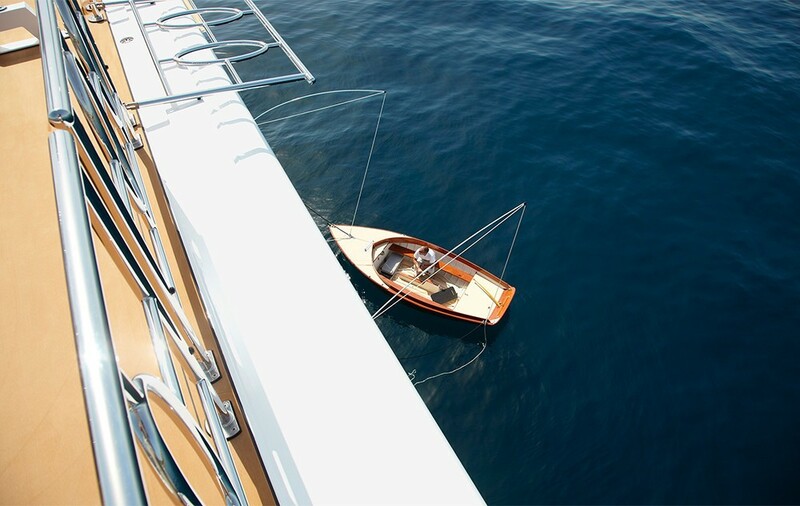 he furthest aft area serves as a storage spot for a rescue boat, a 19 ft crew/owners tender and a small sailing boat, all launched by the rescue boat crane that can also act a 2000 kg cargo crane. 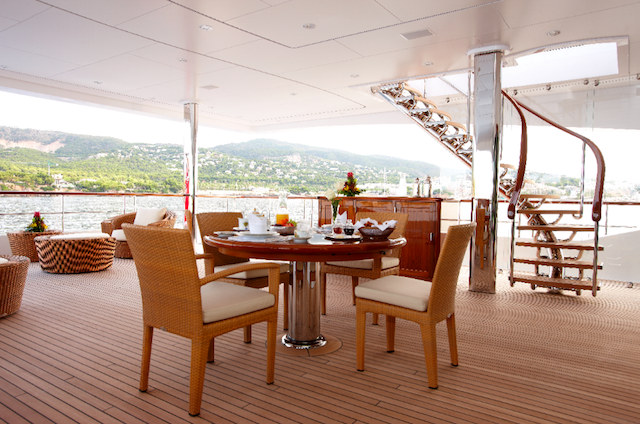 The primary purpose of this section of the deck however, is to serve as a helipad. 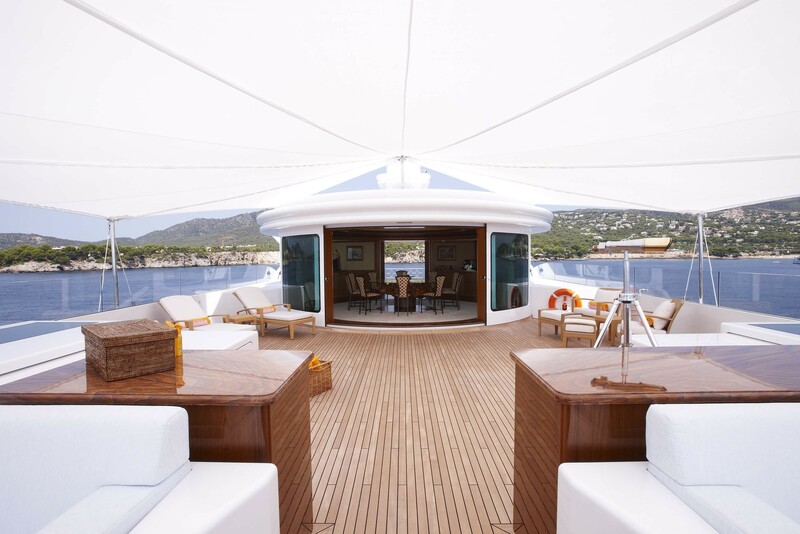 The entire area forward area f the sun deck cab be covered by large awning. 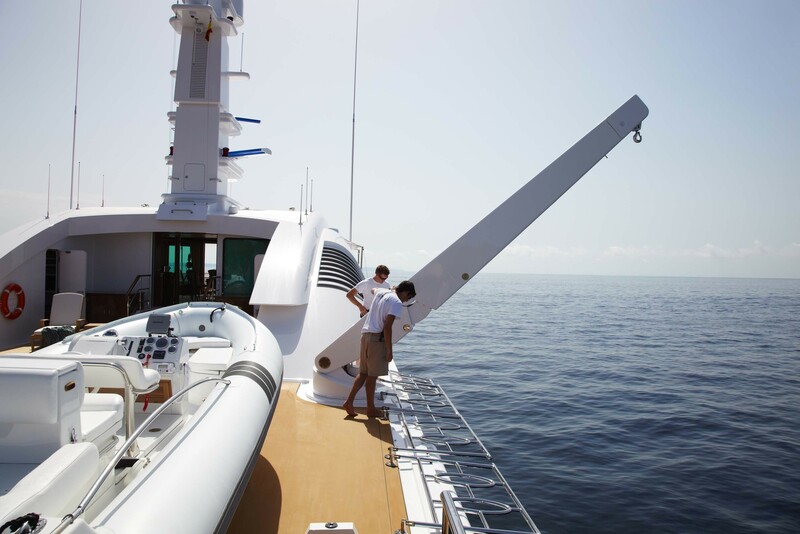 On the port side is a sliding hatch covering the crew staircase, which descends all the way down to the tank deck. 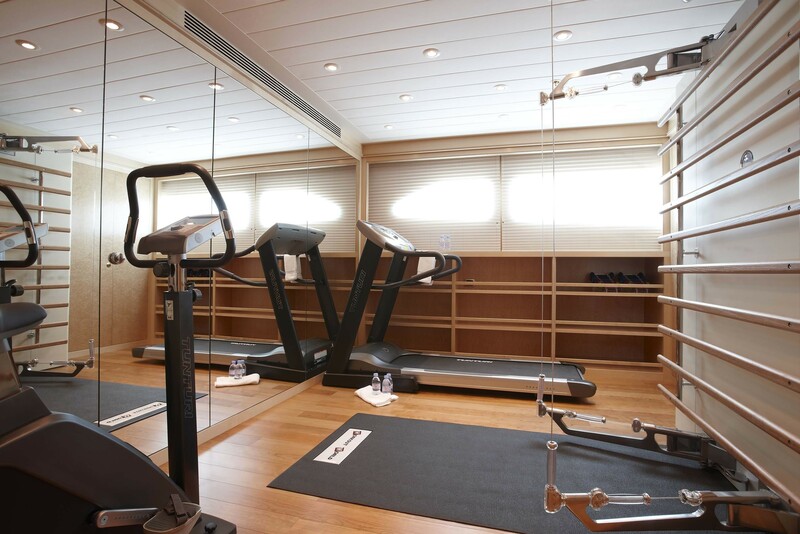 There is also a food lift station, which at the press of a button rises to the flush point on the sun deck. Once the hatch has been opened the lift then ingeniously rises up to service level. 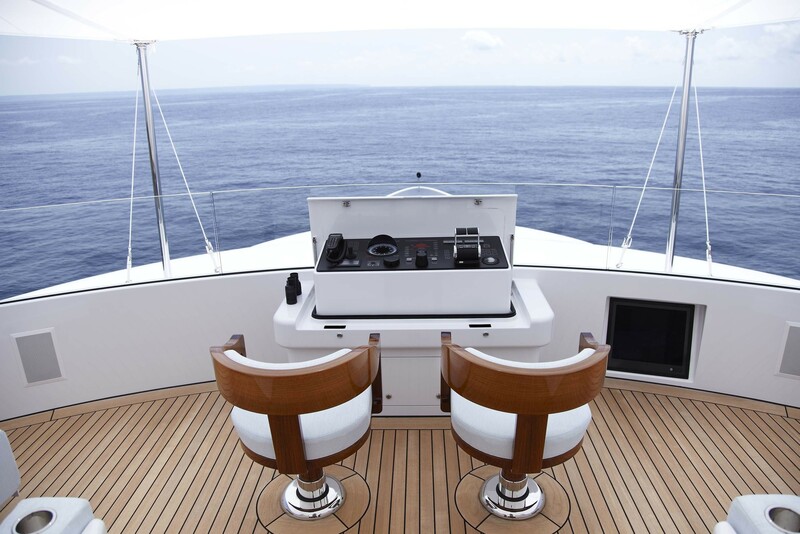 Another inventive addition – and certainly an unusual one for a 68-metre motoryacht – is a flybridge, featuring two pilot chairs so that the owner can sit next to the skipper. 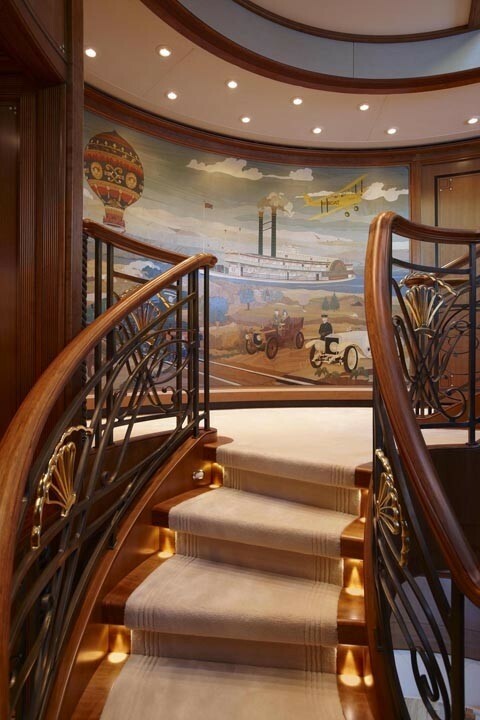 On the starboard side of the deck is the entrance to the owners’ staircase, a circular structure that spirals all the way down to the cinema on the tank deck. 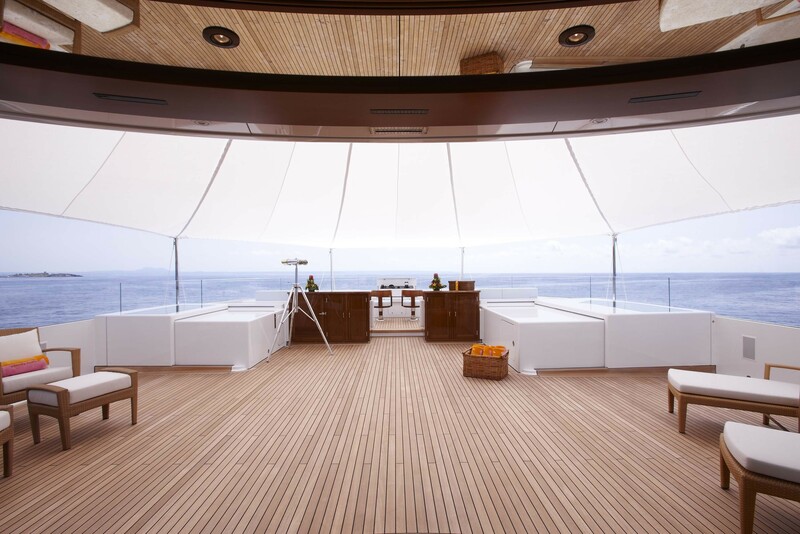 With a full 180-degrees of windows ensuring a panoramic vista, the full beam owners’ observation room is a sensational place to watch the world go by, and reflects the fact that Lady Christine Yacht will be travelling anywhere from the Philippines to Papua New Guinea, Alaska to Ecuador. 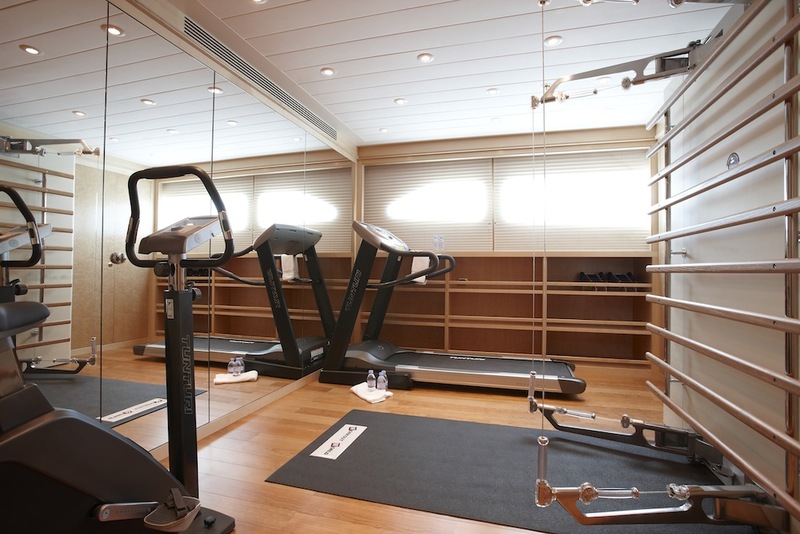 Aft of the observation room is the owner’s gymnasium with a treadmill, cycling machine and other exercise equipment. 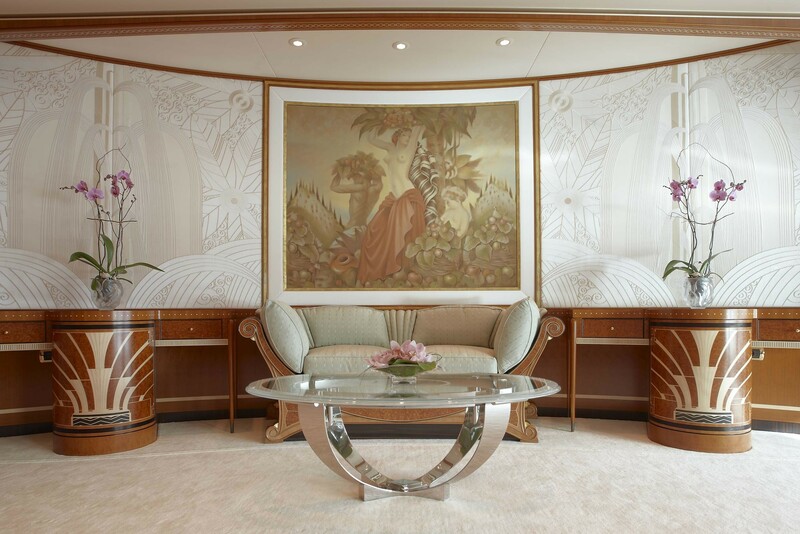 The master stateroom is stylishly uncluttered and spacious, embracing the full beam of the boat. 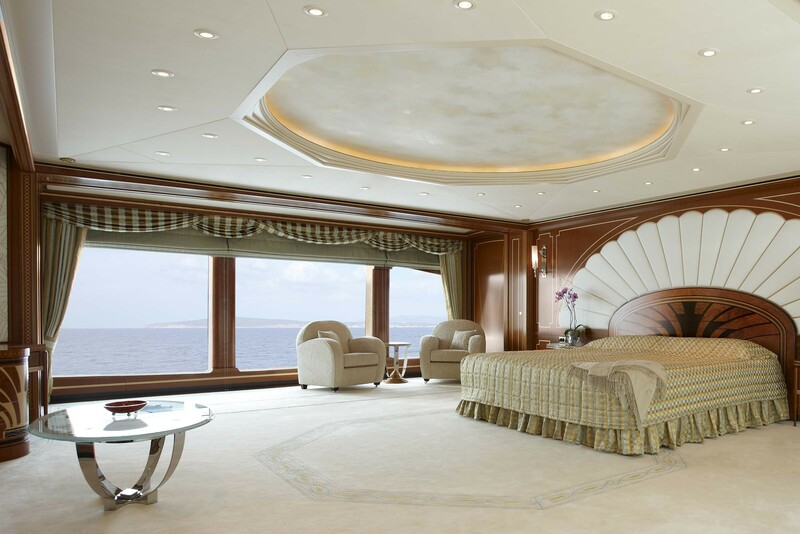 The giant windows in this room accentuate the open ambience created by fitting only a large bed and a sofa/sideboard arrangement. 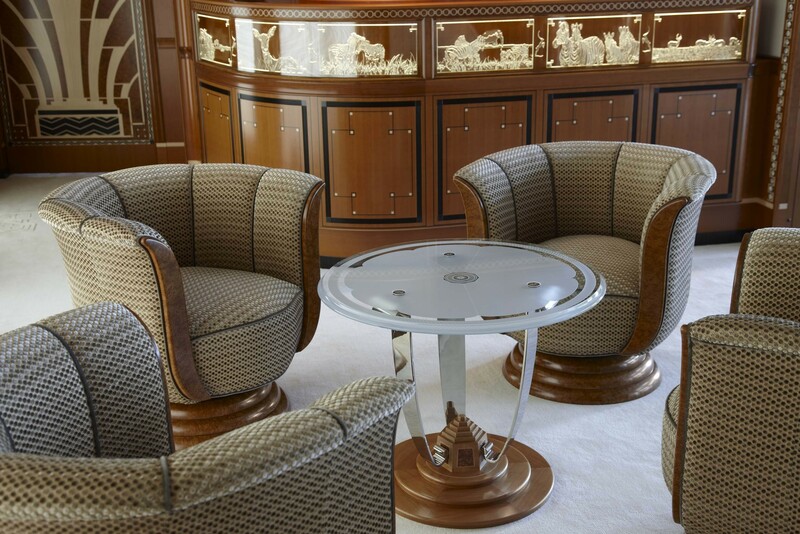 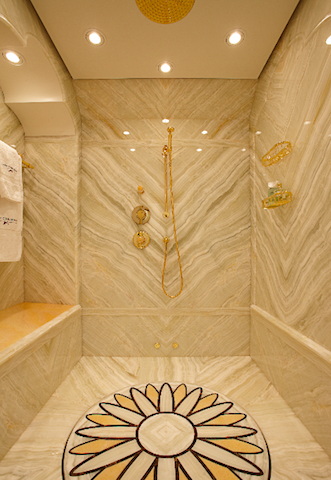 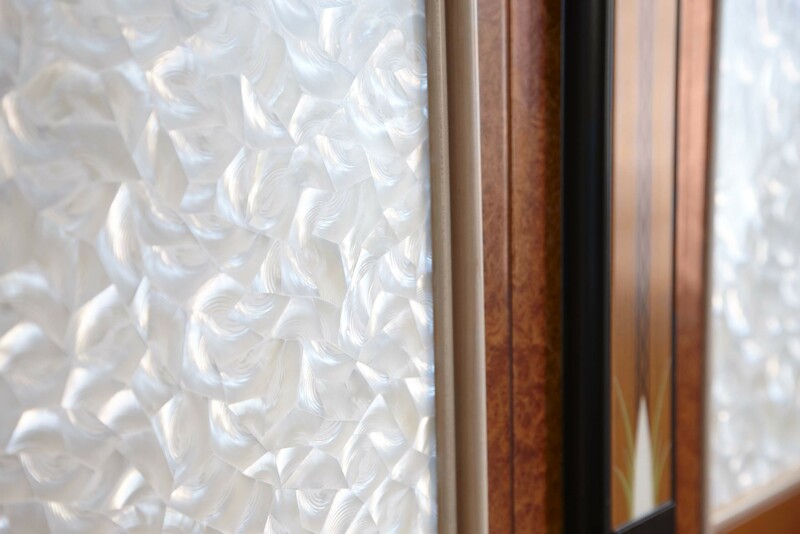 The quest for the finest of fine detailing is taken even further in the two studies located aft of the stateroom. 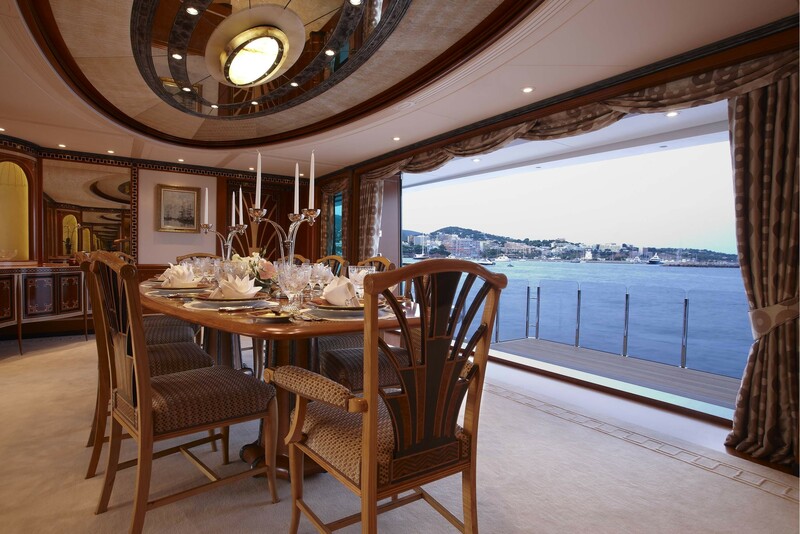 Both ‘his’ and ‘her study have wonderful views aft and to the sides, with glass doors leading to a large private aft deck. 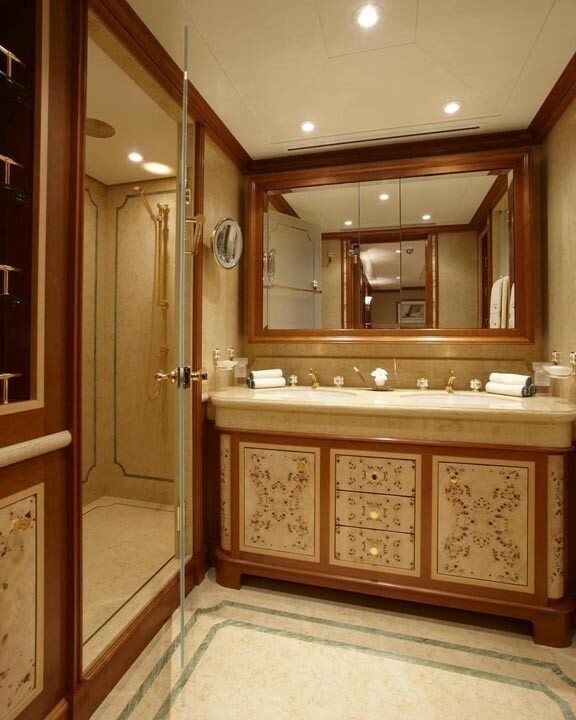 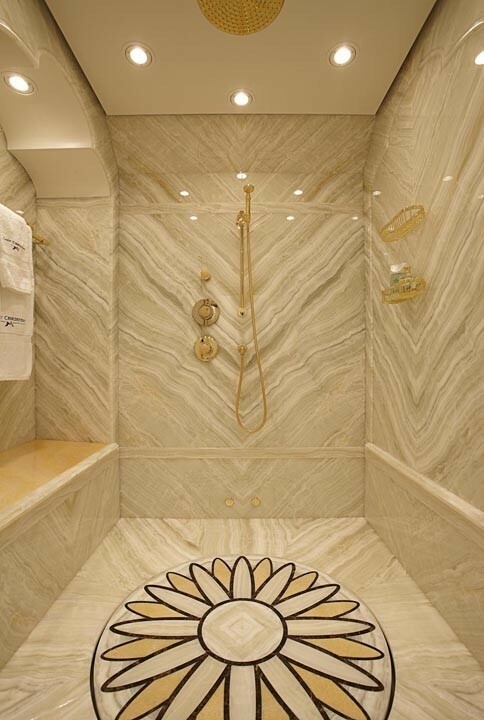 Located forward of the bedroom, the awe-inspiring owners’ bathroom is made particularly lovely by the quality of the book-matched cream onyx and its soft mouldings. 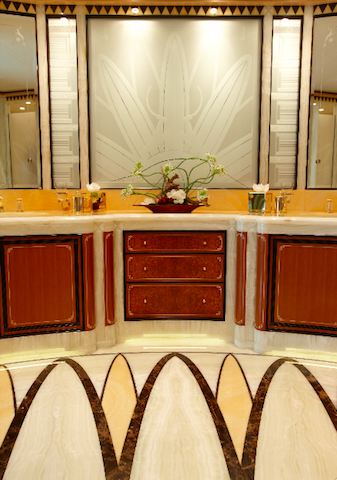 The vanity unit has a yellow onyx inlaid top and inlaid cherry cabinet doors and curved panels. 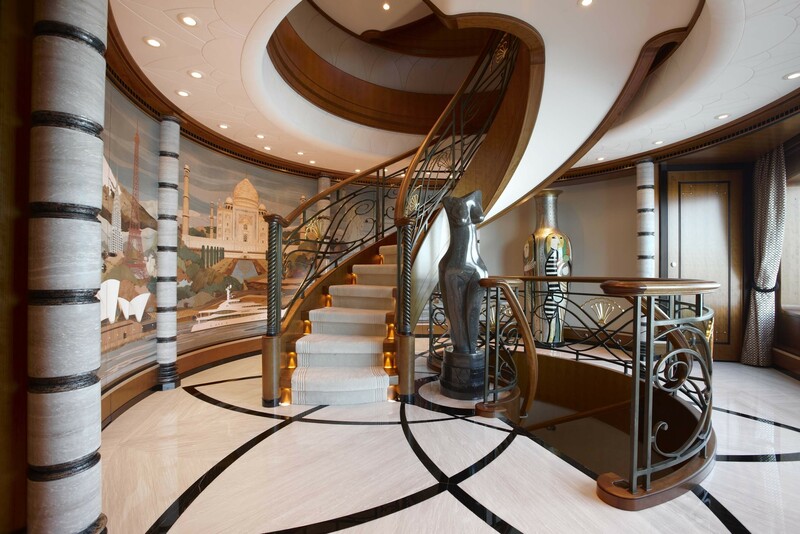 The formal entrance to Lady Christine luxury motoryacht on the main deck features a fabulous spiral staircase that winds up to the two decks above and down to the cinema below. 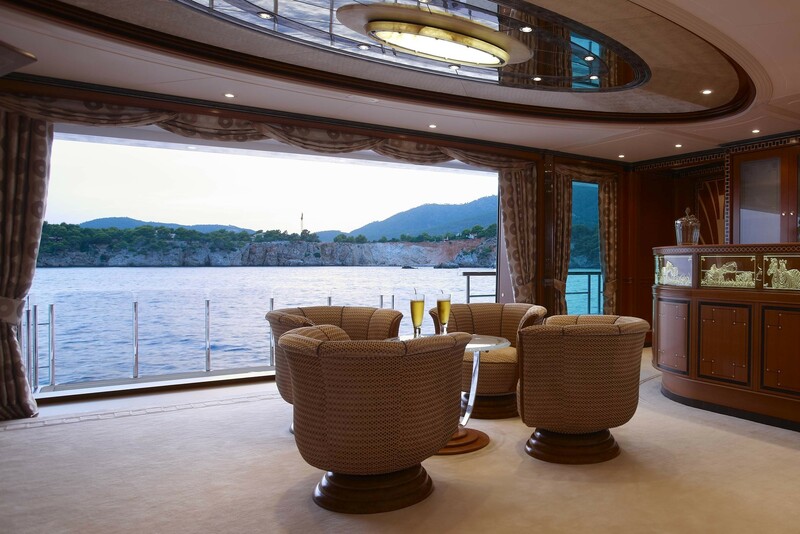 Entering into the full beam bar and dining room, one is instantly struck by the effect of the full-height windows, which can be opened up on both sides of the room and a large platform slides our horizontally beneath the floor to create terraces to both port and starboard. 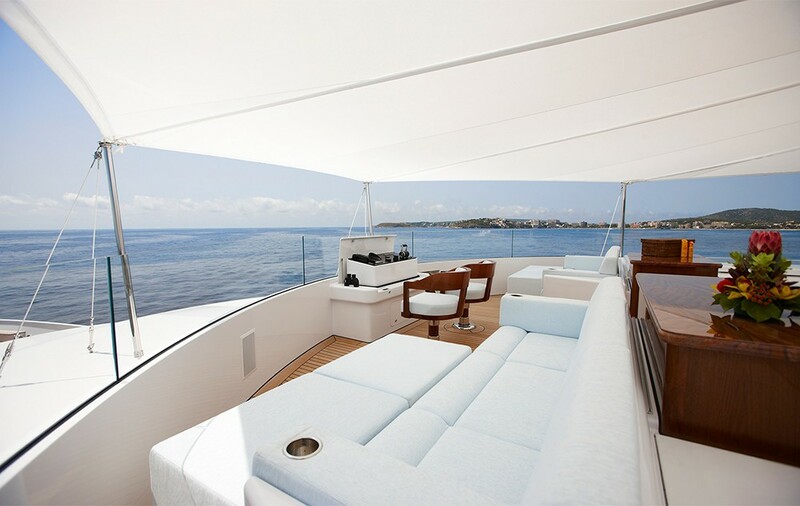 Increasing the beam of the deck in this area to almost 15 metres, the ‘balconies’ offer lots of space for tables and chairs and are fenced off by stainless steel stanchions with transparent Lexan instead of glass in order to be safe for the canine guests. 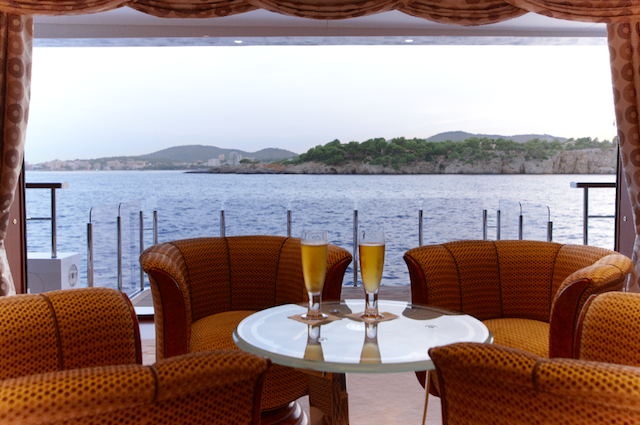 Accessible from both the bar and dining room, the main deck lounge is another splendid place. The main deck aft area is also full of surprises. Instead of a central double sliding door, there are two separate doors on either side of a central seating arrangement. Returning forward, the raised part of this deck is used for service and crew. 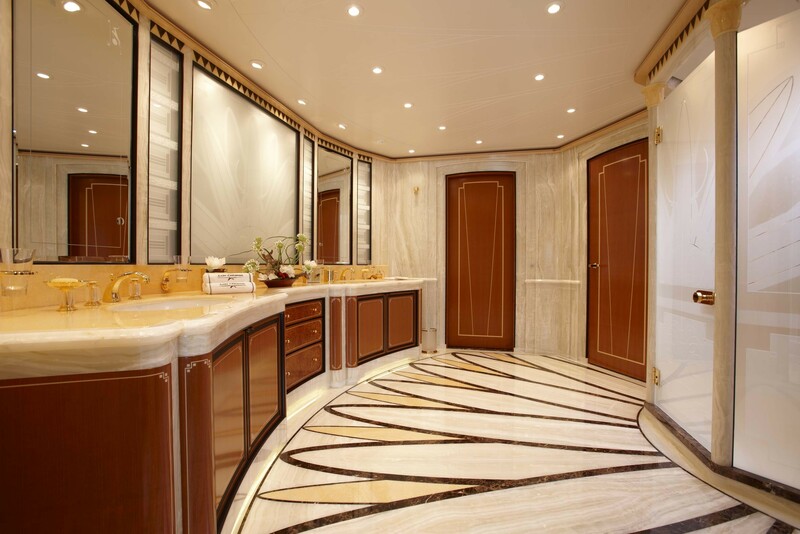 Opposite the galley on the starboard side is the ensuite captain’s cabin. 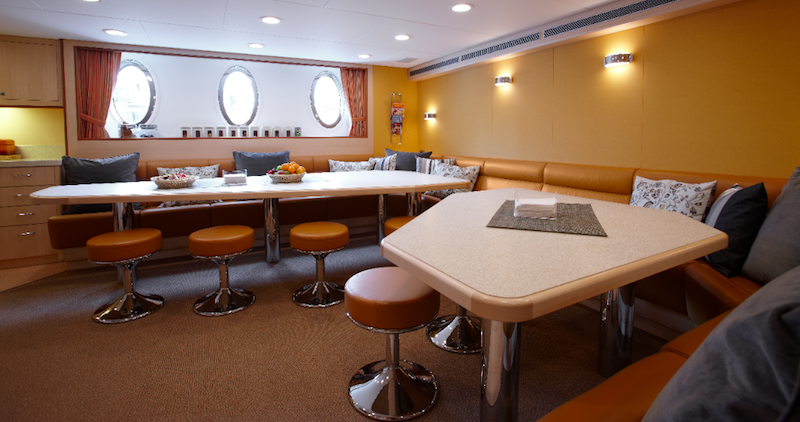 Forward are the first of the generous crew accommodations, quite a number of which have beds side by side rather than bunks. 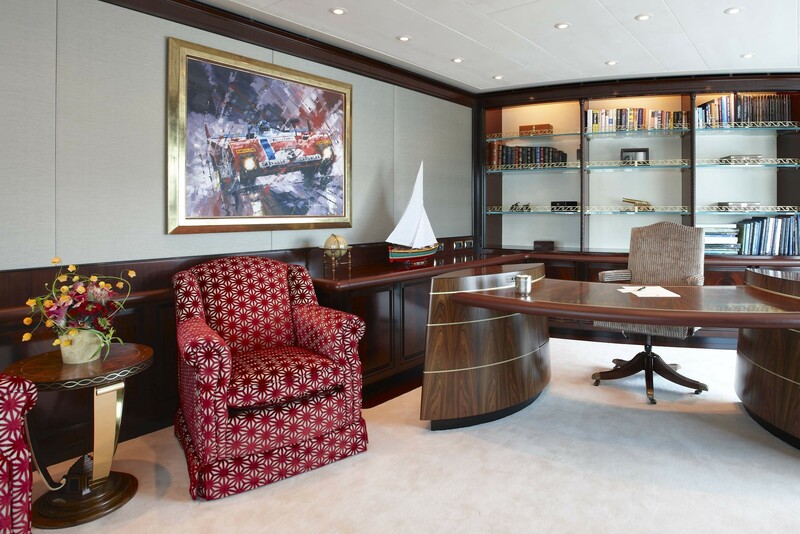 Moving further forward to the raised main deck, to port is a ship’s office with various workstations, with an air conditioning room opposite. 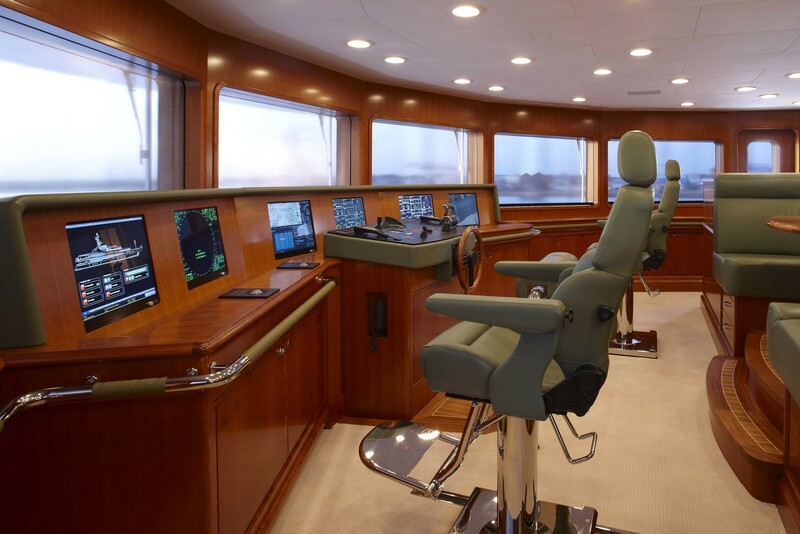 The wheelhouse is classic Feadship, with the conning display, two radars, electronics, CCTV and alarm systems efficiently spread across six screens. 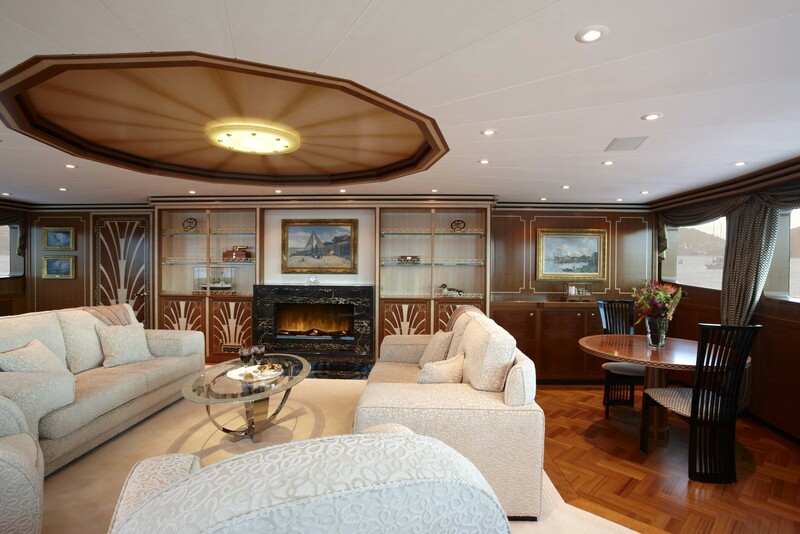 The lower deck of Lady Christine features four guest suites, one with twin beds and the other three with doubles, all placed athwartships rather than the traditional fore and aft arrangement. 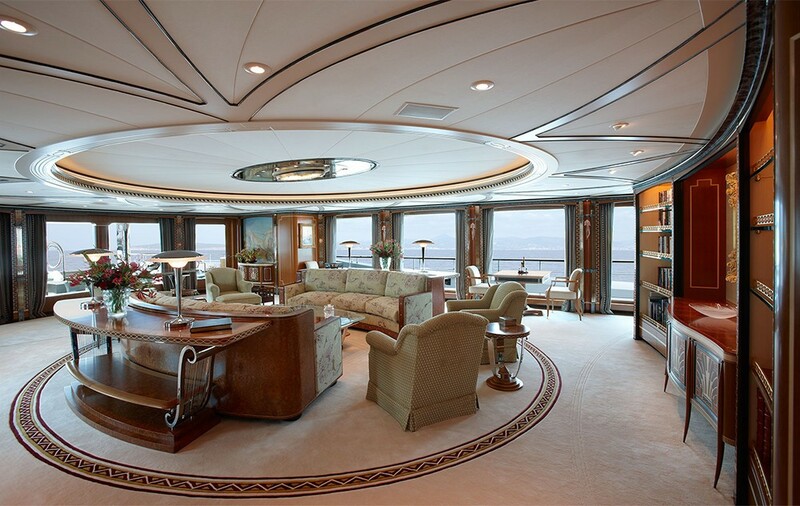 Spaciousness is also the first thing one notices upon arrival in the engine room, which is spread out across two levels. 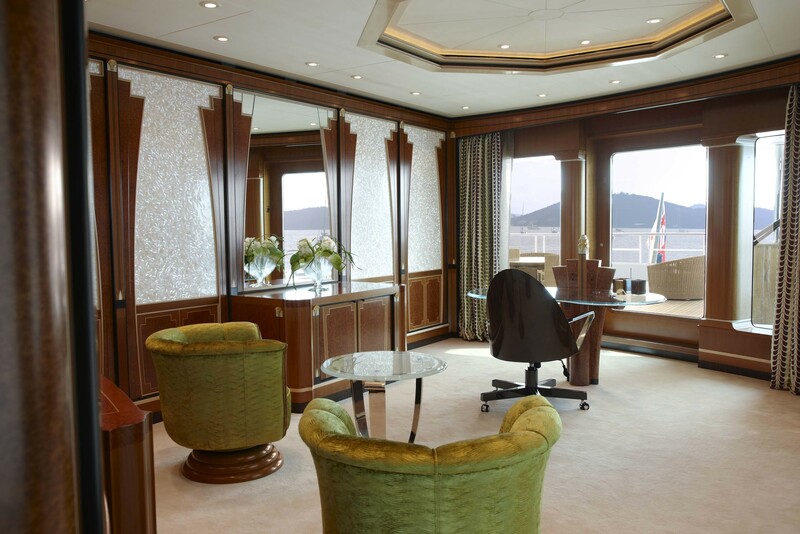 The entrance on the lower deck is via a sound-proofed control room/main switchboard room, and every piece of equipment has been placed in such a way that it can be serviced from any angle. 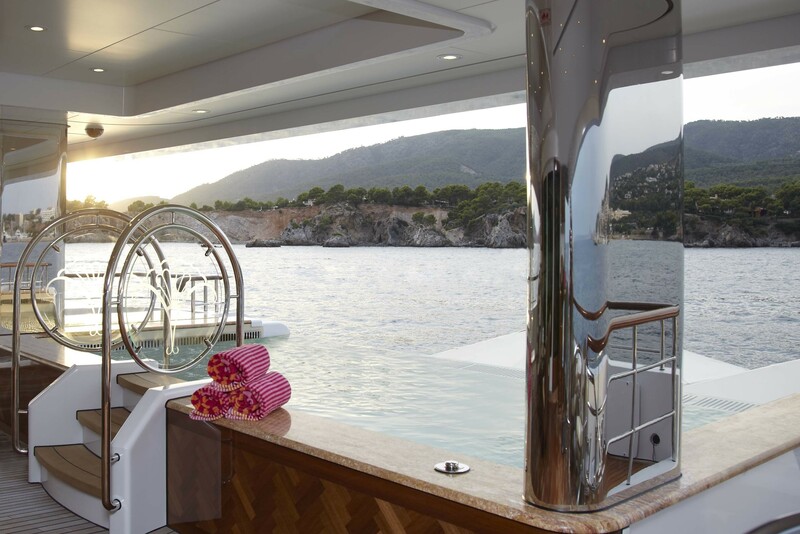 Luxury SuperYachtLady Christine is powered by 12-cylinder MTUs, not the 16 cylinder engines one might expect on a yacht of this size. 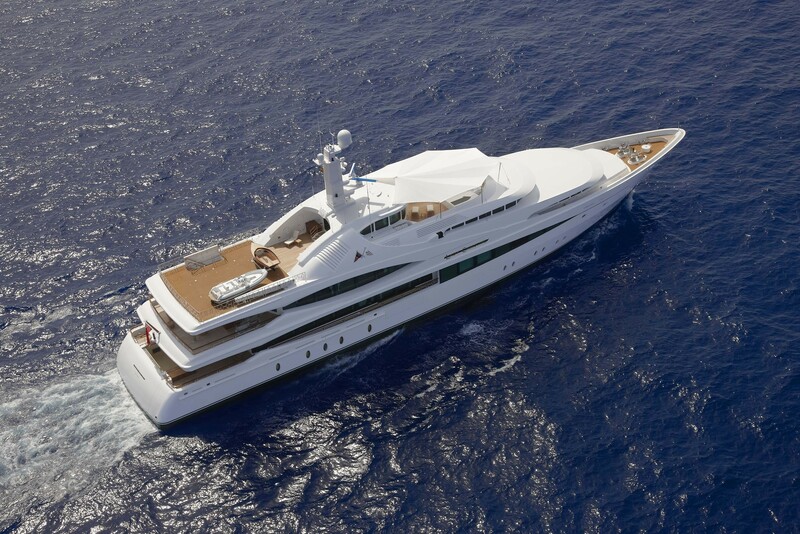 This reflects the fact that the owners are never in a hurry and find a top speed of 15.5 knots easily sufficient. 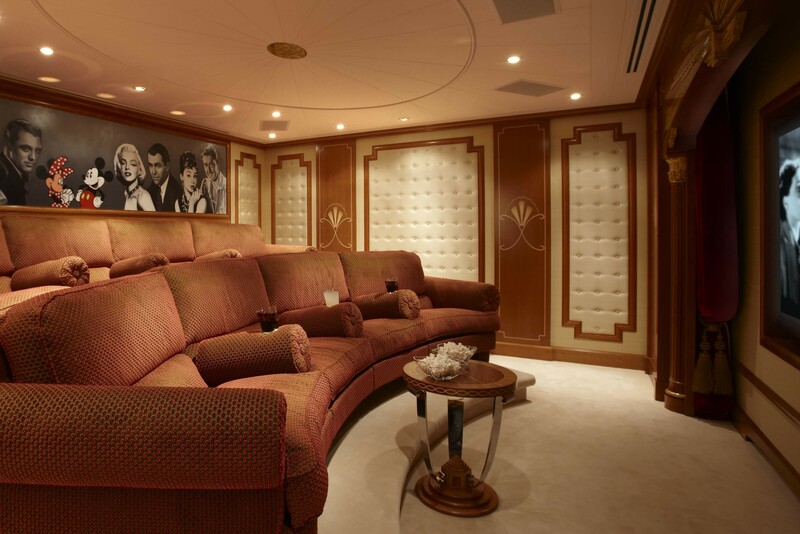 Heading forward of the engine room, on the starboard side is a luxurious cinema for eight decorated with icons of the movie world. 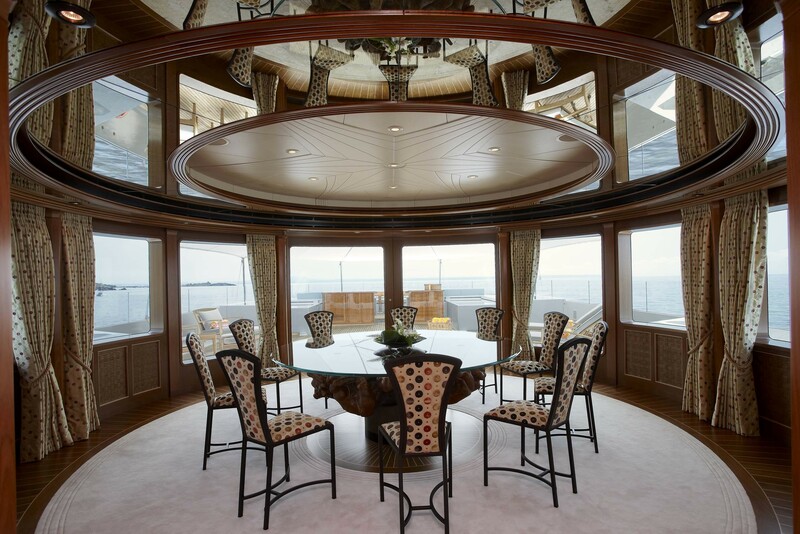 To port is the crew mess with two large tables and a partitioned galley. 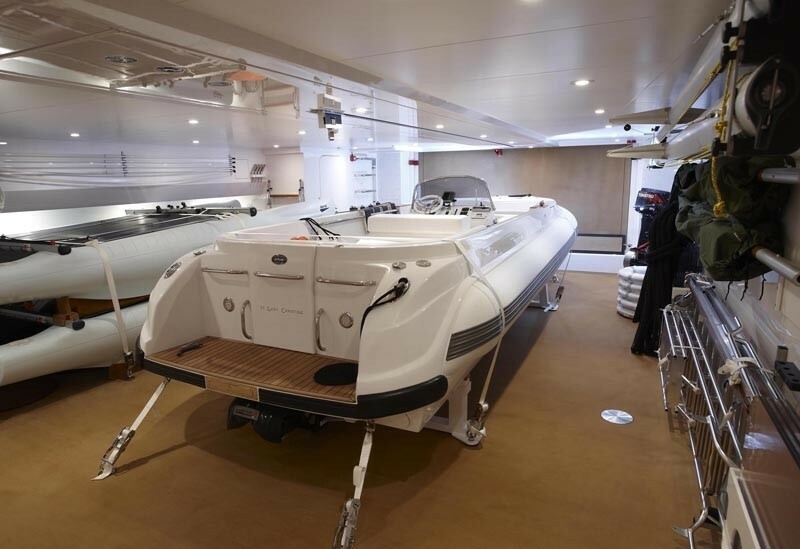 Furthest aft on the lower deck is the tender garage. 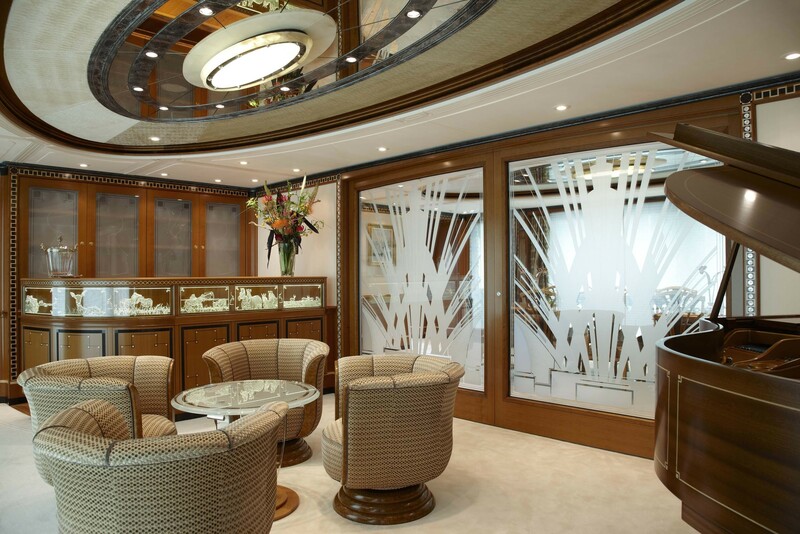 The main entrance is via the elegant swim platform, and a guest powder room has been located in the corridor so that guests do not have to go upstairs when spending the period in this beach club area. 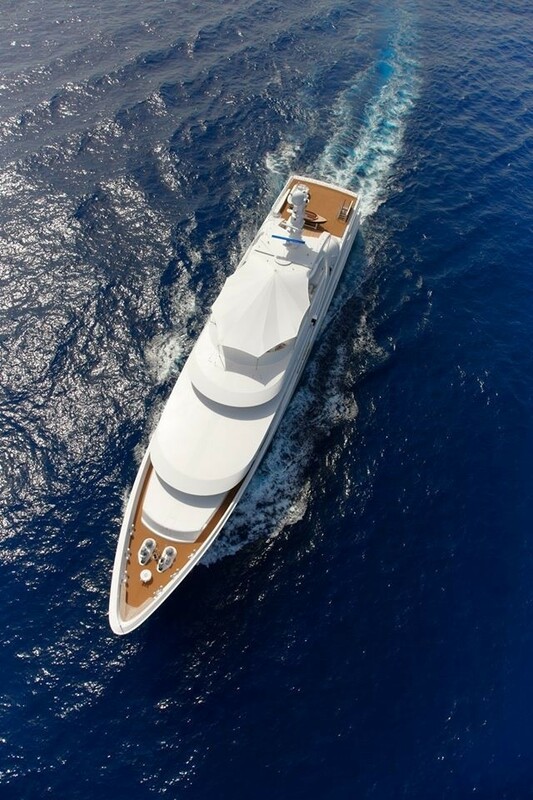 The lazarette itself is a very big space, easily housing a 23-foot tender that is launched athwart-ships via a platform that folds down rather than up in order to increase the options for launching when in a swell. 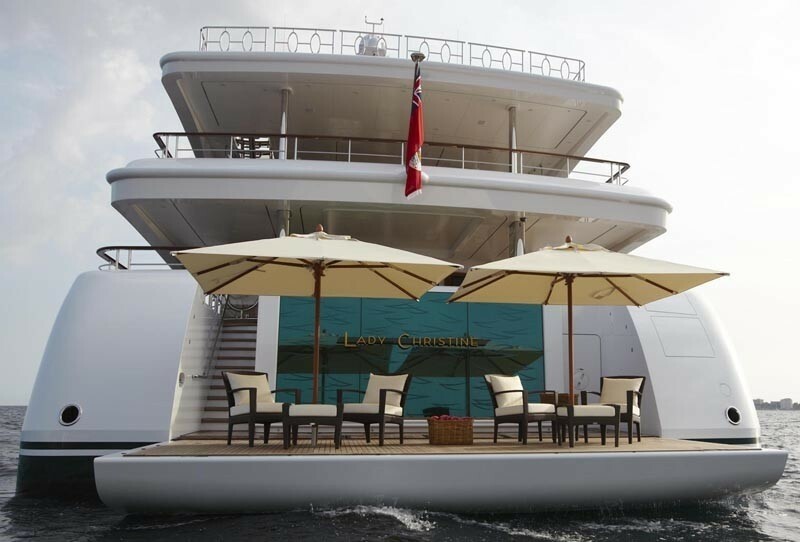 This set up also facilitates bringing out the two owners’ catamarans onto the platform, where they can be rigged prior to launching. 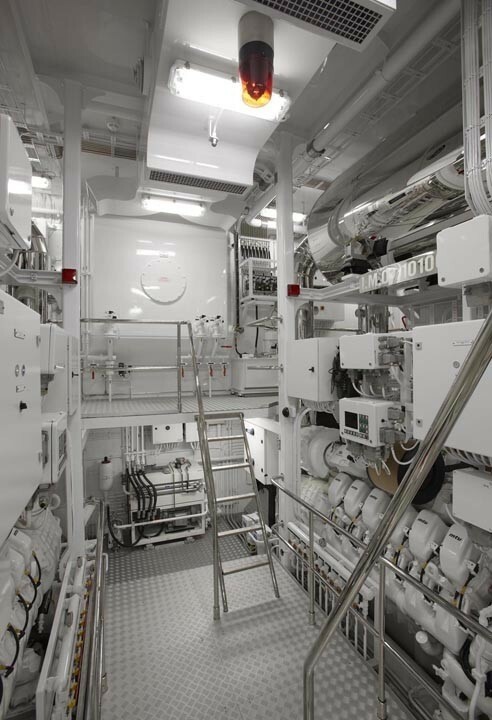 Underneath the floor are two Lloyd’s-approved helicopter fuel tanks contained in a separate cofferdam plus a fuel pumping system that ensures a consistent flow to the fueling station on the sun deck. 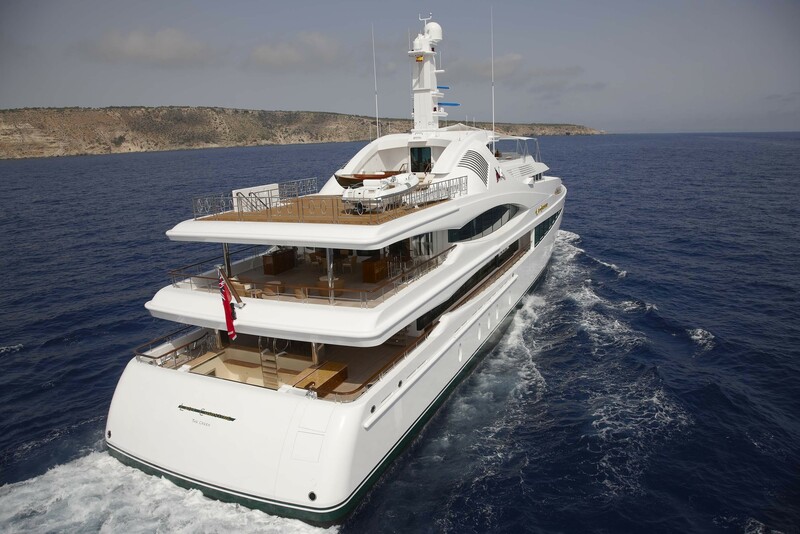 Also contained in this lazarette are all kinds of water toys, scuba gear, an emergency generator and, beneath the floorboards, the heating and filtration system for the swimming pool and waterfall. 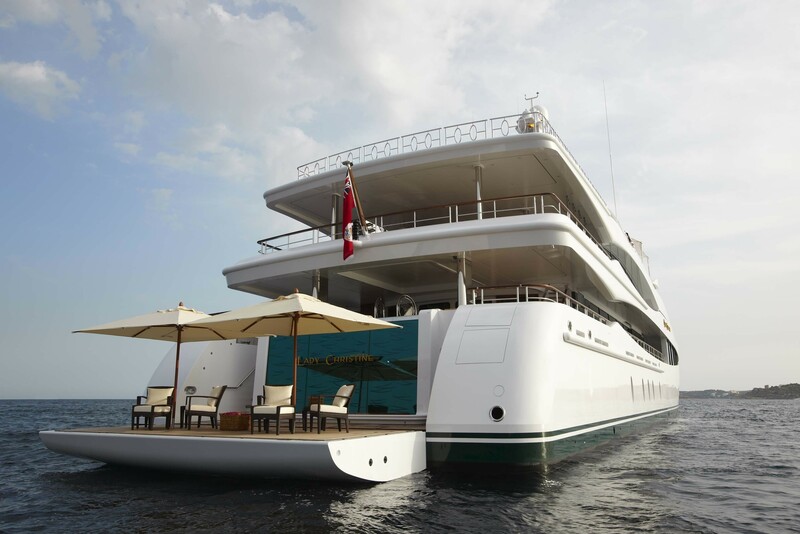 In another tribute to Feadship quality, even the emergency generator space is finished to the highest possible standard and very accessible. 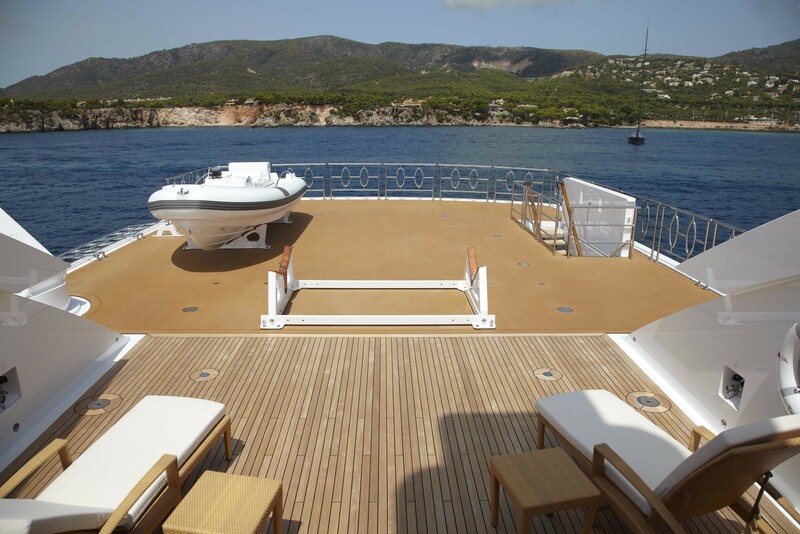 As is the case with the foredeck and the helipad, the floor covering of the lazarette and launch platform is made of Future Teak, an eco-friendly product from the Dutch company Bolidt that is much easier to work with for the crew. 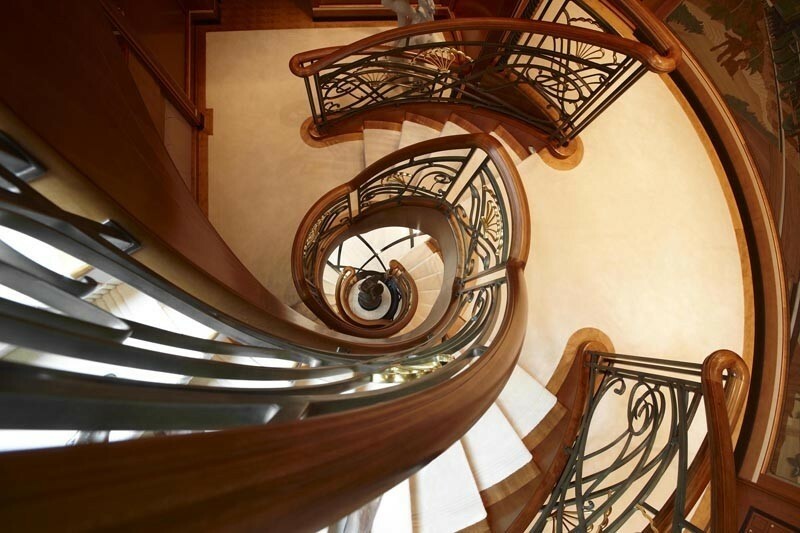 While Future Teak can be made into planks, the owners deemed that unnecessary here. 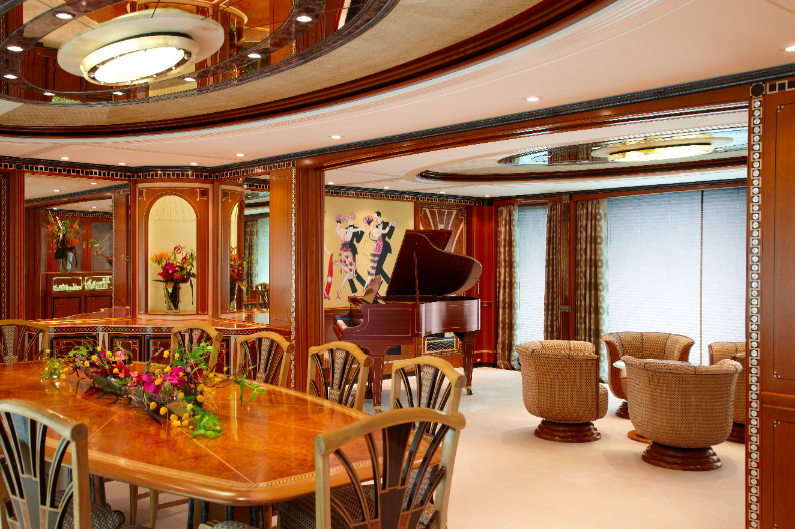 Lady Christine can accommodate a maximum of 10 guests in 5 cabins. 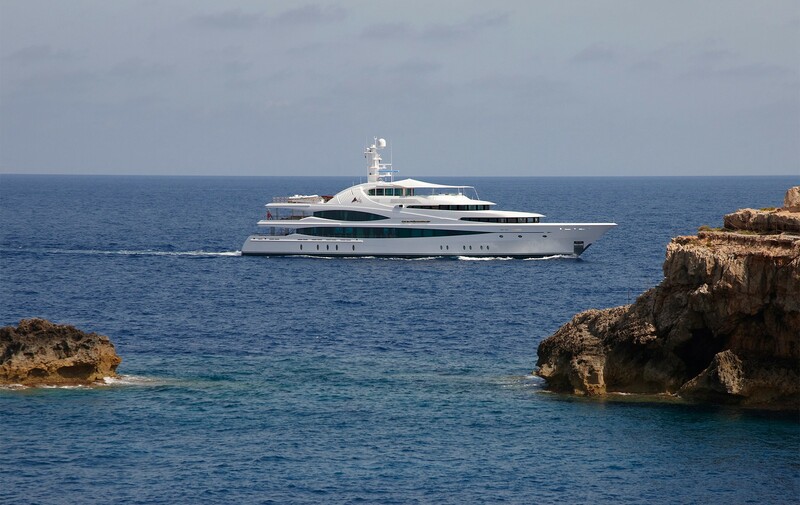 We do have available further amenity, owner and price information for the 68.00m 223’1” yacht Lady Christine, so please enquire for more information.